In 2003, a 89 year old Queenslander, set in a grassed wilderness in suburban Wynnum, Bayside Brisbane, was retrofitted to become an award winning, affordable sustainable house and garden. It took eight months of organic soil improvement work to encourage earthworms to move in and start breeding. Since its beginning, many Australian gardeners have become familiar seeing Jerry Coleby-Williams‘ food garden appearing on ABC TV’s ‘Gardening Australia‘ show. Coleby-Williams has kept a checklist of hundreds of animals, from ants to wasps, that have started visiting and living in his now thriving organic food garden. Most, like spiders, are neither helpful nor harmful. A few, like bronze orange bugs (also known as stink bugs, which damage citrus trees in summer) are troublesome pests. But over the years this 400 square metre plot has benefited from the arrival of a surprising number of useful native creatures, including bees, assassin bugs and mantids. These allies help protect and pollinate crops. “Identification is made easier by referring to Peter Chew’s ‘Brisbane Insects’ website because the images are so good. If I can’t find a match there, I send photos to the CSIRO”, says Coleby-Williams. Earlier this month Coleby-Williams was informed by Dr Graham Brown, a Consultant Insect Taxonomist, the 376th species found at Bellis is Trichopoda giacomellii, a biocontrol of a pest species of sap-sucking Green Vegetable bug, Nezara viridula. Several other species of parasitic Tachinid flies have already been identified at Bellis. Despite resembling related blowflies, this group includes some potent gardening and farming allies. Tachinid flies lay an egg on a pest. When it hatches, the maggot drills into its body and devours it from within. Being eaten alive, from the inside out, is not the kindest death. But it’s very effective. According to the CSIRO, around 80% of caterpillars never make it to adulthood, and this is just one kind of pest controlled by this group of parasites. Blue rutilia (Rutilia simplex). This Tachinid fly parasitises curl grubs (scarab beetle larvae) which live underground, feeding on crop roots. The Green Rutilia (Rutilia rubriceps) is another Tachinid fly. This species parasitises caterpillars. 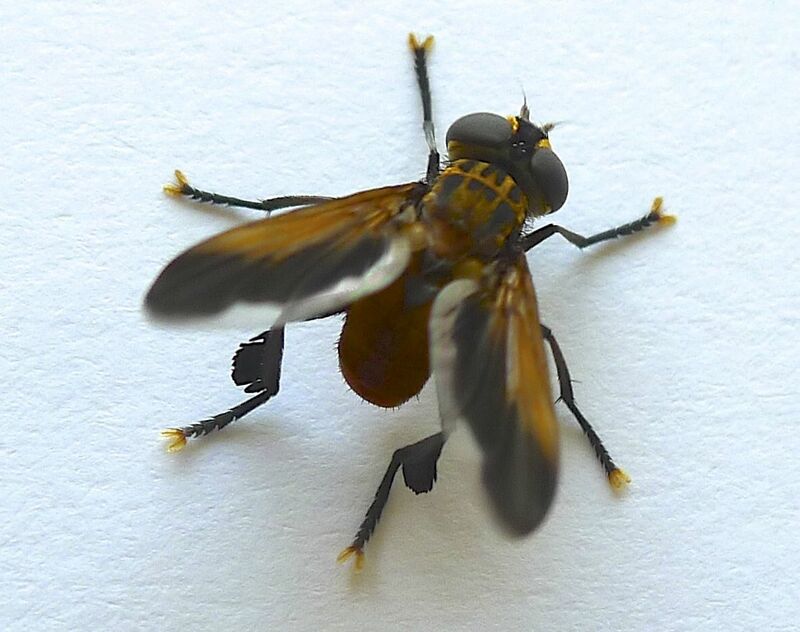 This species of Tachinid fly (Carcelia sp.) is abundant in Brisbane. This adult emerged from a captive caterpillar raised at Bellis. I haven’t mentioned nutgrass since 2004, when I explained that lime and smothering them with sunlight excluding mulch work on the two weaknesses of nutgrass: it likes acidic soil and plenty of sunshine. I also said that by giving it a high nitrogen feed – urea – before mulching increases the effect. The tv seg may still be on the GA website. The nearest Im aware of is Annette McFarlane’s website. Let me know if I’m wrong!